Hardwood flooring has been a staple in most residential homes for years now. Its natural durability and beauty makes it still a popular choice when re-flooring a home. At Queens Carpet One Floor & Home we carry only the best quality hardwood products and brands for our customers. Not only are you getting a durable floor, but you are also adding value to your home. Our flooring professionals are here to help you navigate our hardwood selection. They can provide professional advice when it comes to hardwood and how to choose the right type and style for your home. Hardwood comes in a variety of species, colors, grain patterns and more. Choose a floor that complements your home décor or a floor that reflects your personal style. A common question we hear from our customers is what the difference between solid hardwood and engineered hardwood is. Solid hardwood is just one piece of wood that has a finished surface, whereas engineered hardwood is multiple real wood veneers cross-pressed together with a finished surface. Each type of hardwood has special benefits, like how engineered hardwood is dimensionally stable and solid hardwood has unmatched value and characteristics. Neither is better than the other, but one might work better for your home than the other. When regularly maintained, hardwood floors can last a long time and are very easy to clean. Remember, hardwood is not a waterproof option, so be sure to clean spills up right away to avoid water damage. Hardwood is also allergy friendly, because there is no place for dust or dirt to hide and harmful allergens to thrive. Our membership with the Carpet One Floor & Home cooperative allows us to have the buying power of 1,000 stores combined so you can shop quality flooring at valuable prices. We carry name brands you love and exclusive brands like Rustic River™ and Invincible™. If you want to learn more about hardwood, visit our showroom located in College Point, NY. If you’re looking for the best hardwood for your bedroom or any other room, take a look at some of these tips about choosing wood flooring. 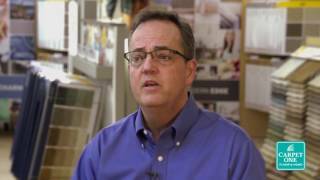 Our very own Jim Aaron explains the differences between solid and engineered hardwood floors. Find out which type would be best for your home.